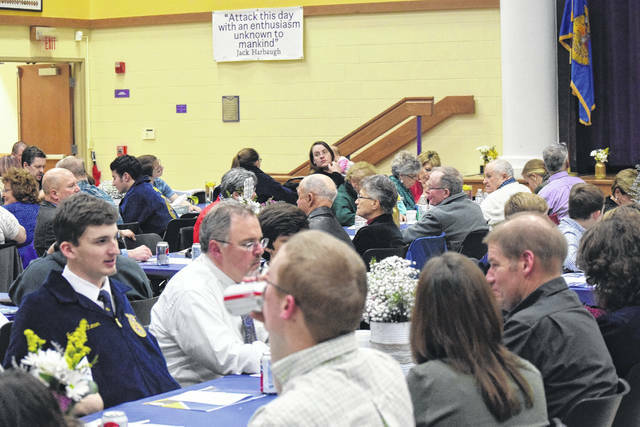 Eaton Miami Valley Career Technical Center (MVCTC) FFA held its 69th annual awards banquet on Thursday, March 29. This was an opportunity to share with the community what the chapter has achieved throughout the year and to honor 2018 graduating seniors. 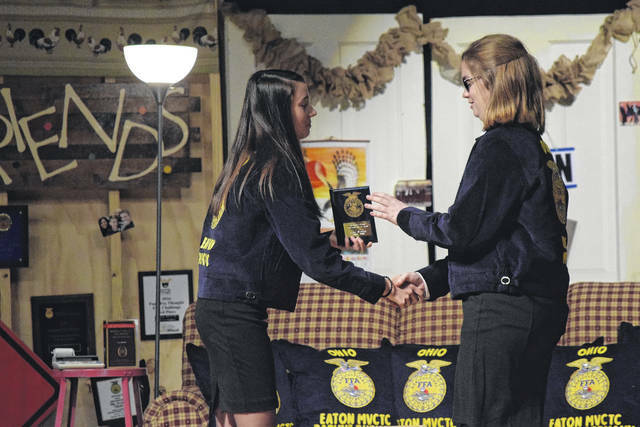 EATON — Eaton Miami Valley Career Technical Center (MVCTC) FFA held its 69th annual awards banquet on Thursday, March 29. This was an opportunity to share with the community what the chapter has achieved throughout the year and to honor 2018 graduating seniors. The theme this year was Friends — as in, the American sitcom. 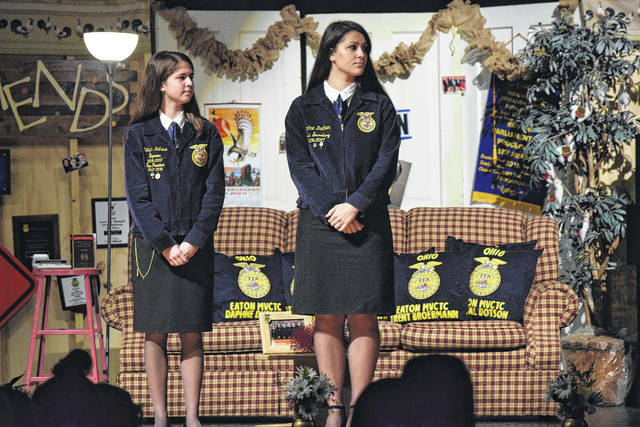 Yet, the theme was really to honor FFA’s legacy of creating friends since 1928. 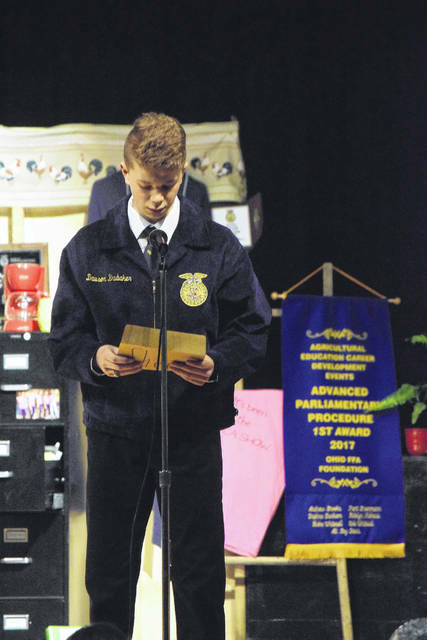 FFA Chapter President Cole Whitesell explained, “Tonight’s banquet is fully focused on recognizing our chapter members for their accomplishments throughout the year, on recognizing the officers, we give out awards, and we have a year in review and a slideshow. I would say it is a night of reflection. 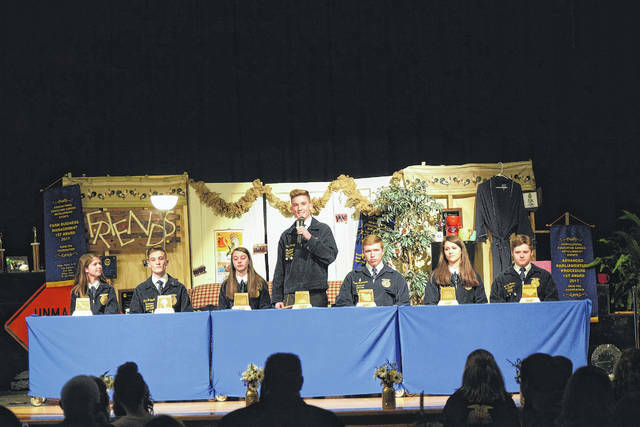 Following dinner, the 2017-2018 Officer Team presented its Officer Skit, where they each went through their offices and roles within FFA. 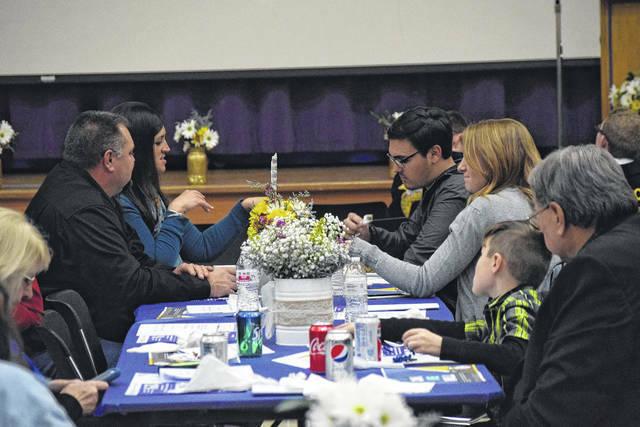 They also recognized guests who were present that have supported the chapter throughout the year. Teams and Achievements were then recognized. 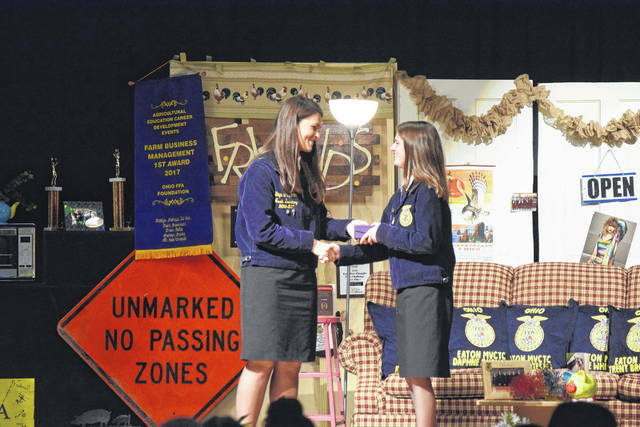 The chapter thanked all who were a part of Ag STEM Day and the Seed Auction. The following members were recognized for various achievements throughout the year. •State FFA Convention: Cole Whitesell, Blake Whitesell, Trent Broermann, Daphne Durham, Katelyn Niehaus, Andrew Brooks, Arica Hamilton, Drew Kahle, Tommy Perry, Jacob Renner, Alisha Rader, Emily Puckett, December Hapner, Gabe Hoff, and Andrew Hendrich. •Placing third in County and 15th in District for Rural Soils: Ella Bruce, Trent Broermann, Felix Durham, Spencer Hunt, Carson Shafer, Kendale Hamilton, Megan Hall, and Mallory Deaton (who placed fourth as an individual). •Placing first in County and 13th in District for Urban Soils: Crystal Dotson, Andrew Brooks, David Driver, Kaleb Gibson, Nick Yun, Remington Asher, Abby Wysong, Gabe Hoff, Tommy Perry, Jarod Lee, Jacob Renner, and Rebecca Wright (who placed first as an individual at County and 16th at District). •National Convention: Cole Whitesell, Blake Whitesell, Andrew Brooks, Trent Broermann, Daphne Durham, Katelyn Niehaus, Drew Kahle, Becky Wright, Gabe Hoff, Kendale Hamilton, and Aaron Hendrich. 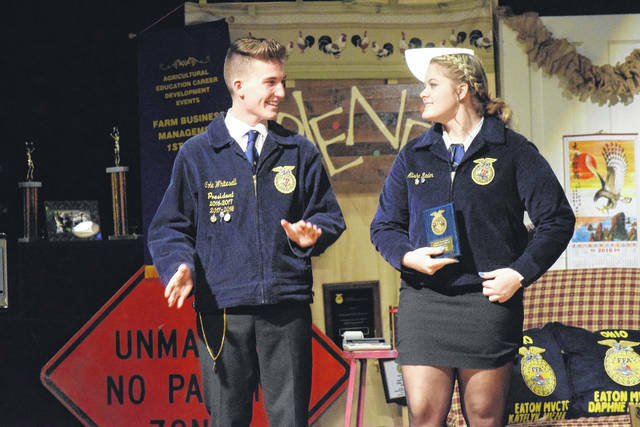 •Job Interview: Fourth Year Katelyn Niehaus Second District. •Placing Second in Sub Districts and Third in Districts in Parlimentary Procedure Advanced: Becky Wright, Ella Bruce, Gabe Hoff, Jacob Renner, Brianna Baker, and Kenley Weir. •Placing First in Sub Districts, First in Districts, and Second in heat at State in Parliamentary Procedure Novice: Ryan Brooks, Dawson Brubaker, Rachel Buckler, Mallory Deaton, Felix Durham, Kendale Hamilton, Spencer Hunt, and Jacob McIntosh. •Public Speaking Creed: Spencer Hunt for placing first in Sub Districts and Kendale Hamilton for placing Second in Sub Districts. 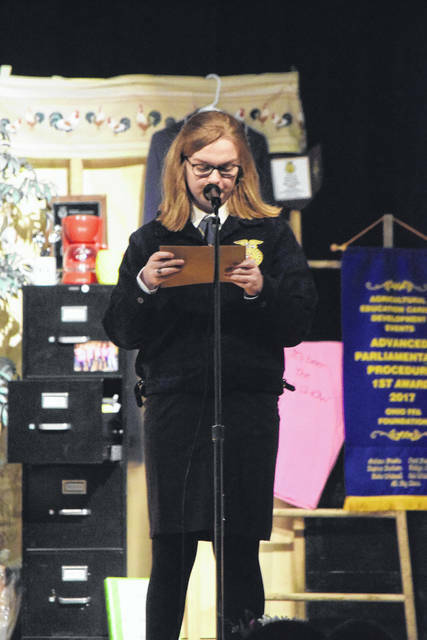 •Public Speaking Advanced Creed: Ella Bruce for Placing Second in Sub Districts and First in Districts. 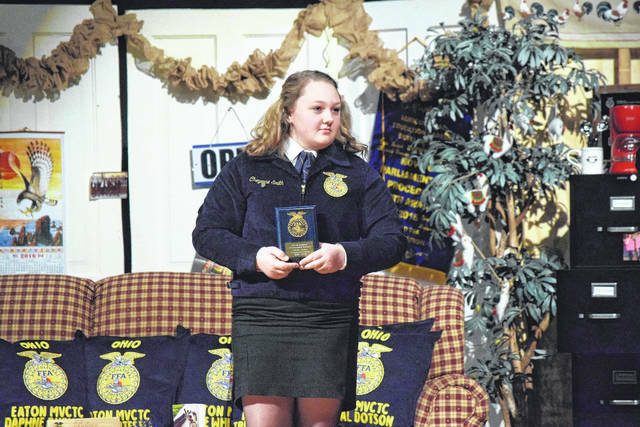 •Public Speaking Beginning Prepared: Becky Wright for placing First in Sub Districts and Second in Districts. 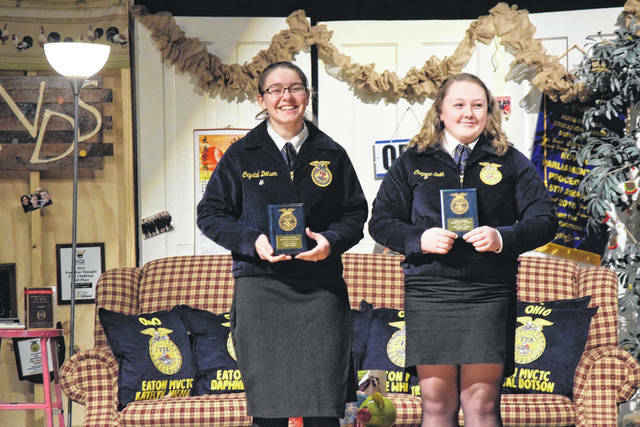 •Public Speaking Advanced Prepared: Katelyn Niehaus for placing First in Sub Districts and Second in Districts, and Arica Hamilton for placing Second in Sub Districts. 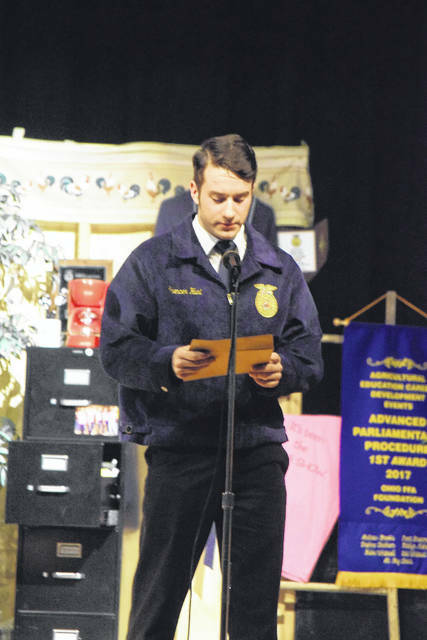 •Public Speaking Extemporaneous: Andrew Brooks for placing First in Sub Districts and Second in Districts. •Placing Fourth in Districts for Ag. Sales: Trent Broermann (First Individual in Districts), Cole Whitesell, Jacob Renner, Kendale Hamilton, and Susie Rader. •Placing 10th in State for Greenhand Quiz: Spencer Hunt, Kendale Hamilton, Beau Shepherd, Jacob Macintosh, Mallory Deaton, Ella Bruce, Dawson Brubaker, and Ryan Brooks. •Placing Seventh in State for Ag Issues: Katelyn Niehaus, Blake Whitesell, Cole Whitesell, Trenet Broermann, Andrew Brooks, Daphne Durhamn, and Drew Kahle. •FFA Basketball Varsity: First at Twin Valley South and National Trail Tournaments. •FFA Basketball JV: Third at Twin Valley south and Second at National Trail Tournament. •Placing 56th on Online Exam in State for Outdoor Power Equipment: Kenley Weir, Dillon Brewer, Nick Yung, Gabe Hoff, and Jacob Macintosh. Contest to be held in April. •Farmers’ Market: Cole Whitesell, Blake Whitesell, Daphne Durham, Tommy Perry, Jacob Renner, Susie Rader, and Katelyn Niehaus. •Chapter Officer Book Evaluation: Trent Broermann for Gold Secretary, Arica Hamilton for Gold Reporter, and Blake Whitesell for Gold Treasurer. 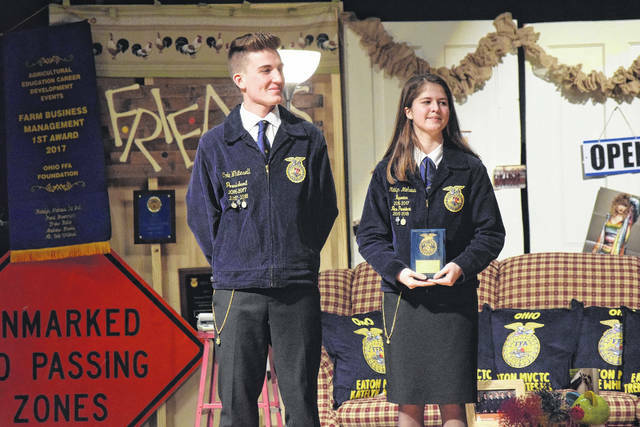 •2016 State FFA Degrees: Andrew Brooks and Arica Hamilton. 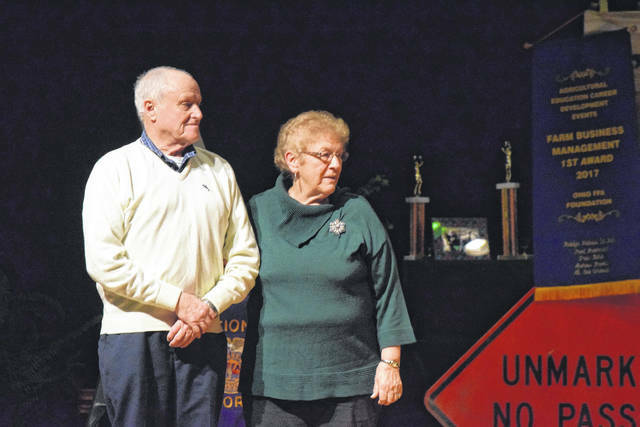 Also during the evening, Louis and Judy Broermann were recognized with Honorary Chapter Degrees. 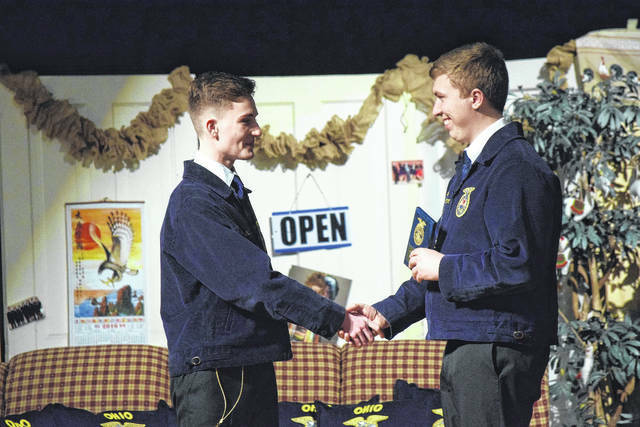 The Broermanns were announced as honorary member candidates and were welcome on the stage, where the officer team recognized them and initiated them into the Chapter. 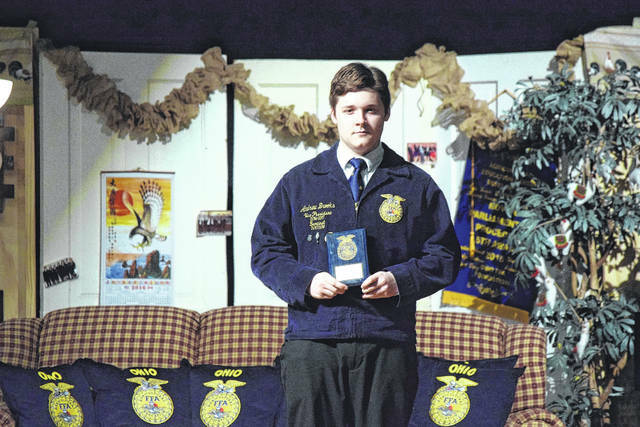 •Accounting Proficiency was given to Blake Whitesell for his service as Treasurer. •Ag. 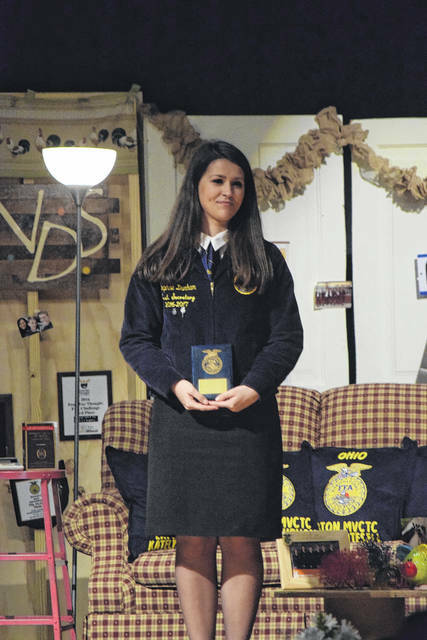 Education Proficiency was given to Katelyn Niehaus for her dedication to Agricultural Education, having worked as a tutor and preparing worksheets for college classes. In 2017, her Ag. Ed. proficiency won the State Contest and won the Silver Rating at Nationals. •Ag. 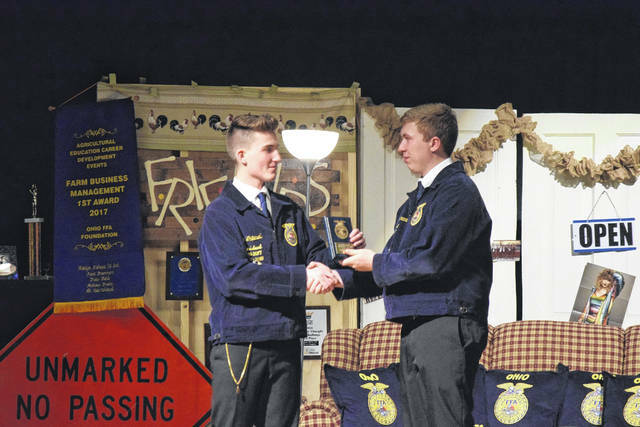 Sales Proficiency was awarded to Andrew Brooks, who had to work with an agricultural related business and has accumulated over 260 hours at Tractor Supply since August. He is in the Top Four in the State. •Beef Proficiency was awarded Trent Broermann, who is involved in the commercial and show cattle side of the beef industry. •Diversified Livestock Proficiency was given to Arica Hamilton, who raised more than one livestock animal. She raised show cattle and market hogs. 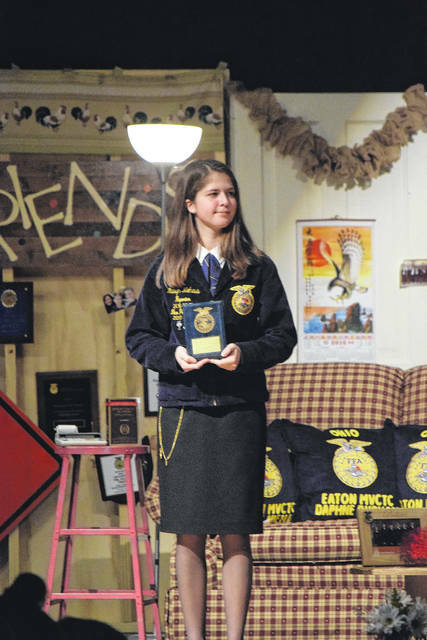 Hamilton will be receiving her State FFA Degree in May. •Food Service Proficiency was presented to Daphne Durham, who received this award for her employment with 1808 Cafe, where she has worked for a year and over 1,000 hours. 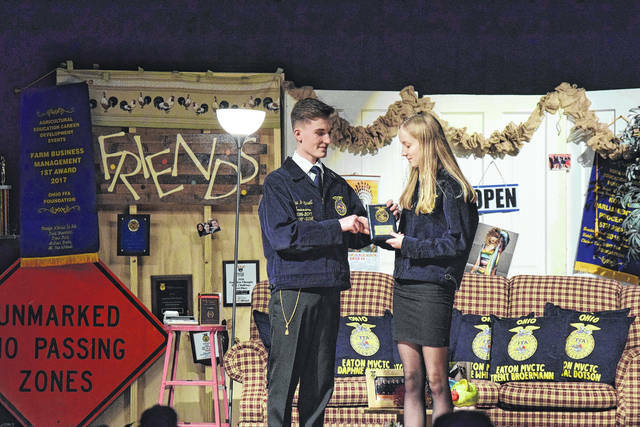 •Forage Proficiency was awarded to Trent Broermann, who received this award for his farm work, where he plans where he mows and breaks his hay. 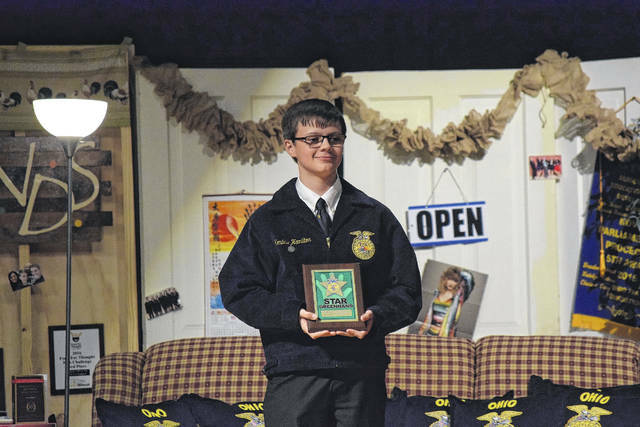 His Forage Proficiency was second in the district and top four in the State. 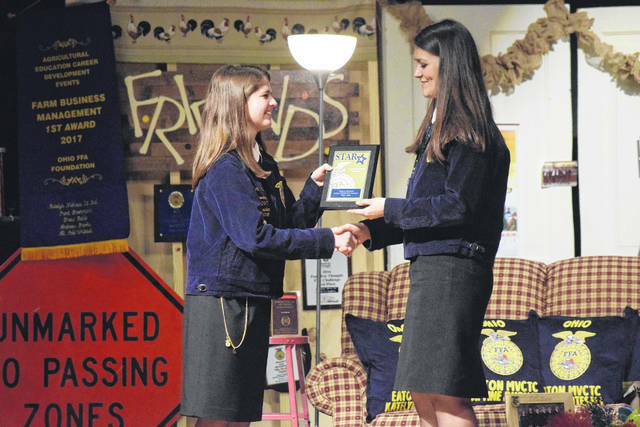 •Fruit and Vegetable Production Proficiency was presented to Rebecca Wright, who is only a Sophomore, but is committed to FFA and has a natural green thumb. •Goat Proficiency was presented to Katelyn Niehaus, who has been working with goats since she was nine years old. Not only does she raise and show her goats, but they are also available at demonstrations and petting zoos. •Home and Community Development Proficiency was awarded to Tommy Perry, who received this award for his work at the Eaton Early Bird Farmers’ Market. 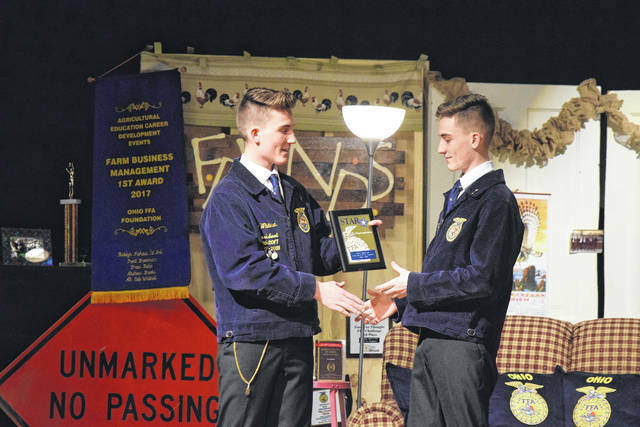 •Job Placement Proficiency was presented to Jacob Renner, who received this award for his employment in the agricultural field. •Sheep Production Proficiency was given to Alisha Rader for her passion for the lamb and wool industry. 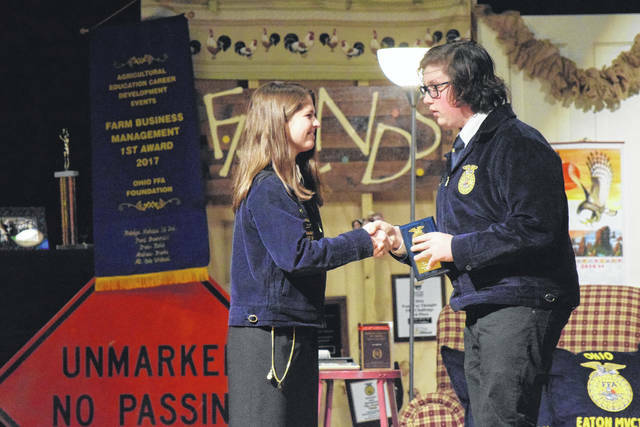 •Specialty Crop Proficiency was awarded to Abby Wysong for raising sweet corn, ornamental, and hand corn. Each crop was ready to harvest at different times. •Small Animal Proficiency was presented to both Cheyenne Smith and Crystal Dotson. 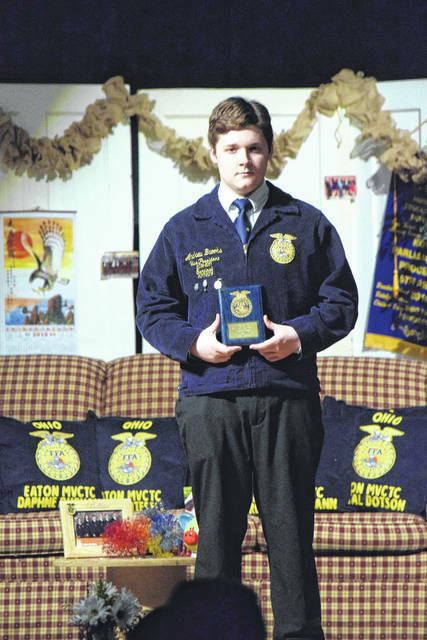 •Swine Proficiency was awarded to Cole Whitesell for working on his family’s swine farm. •Shop and Crop Proficiency was awarded to Susie Rader for the endless hours she spent on making her wooden toolbox. The Officer Team then presented Greenhand and Chapter Degrees to those who have earned them. 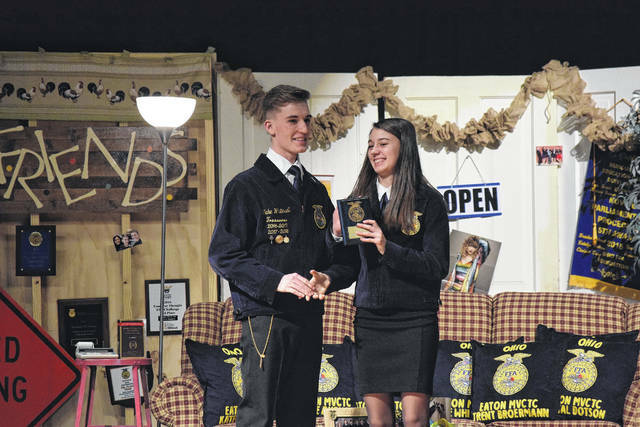 The following students earned their Greenhand Degrees: Ella Bruce, Mallery Deaton, Kendale Hamilton, Jacob McIntosh, Carson Shafer, Dawson Brubaker, Rebekah Ruthers, Felix Durham, Craig Posey, Ethan Howard, Ryan Brooks, Spencer Hunt, and Jaclyn Wallen. The following students earned their Chapter Degrees: Briana Baker, Todd Coates, Gabriel Hoff, Nick Yung, Rebecca Wright, Abby Wysong, Tommy Perry, Susie Rader, Jacob Renner, Cheyenne Smith, Kenley Weir. 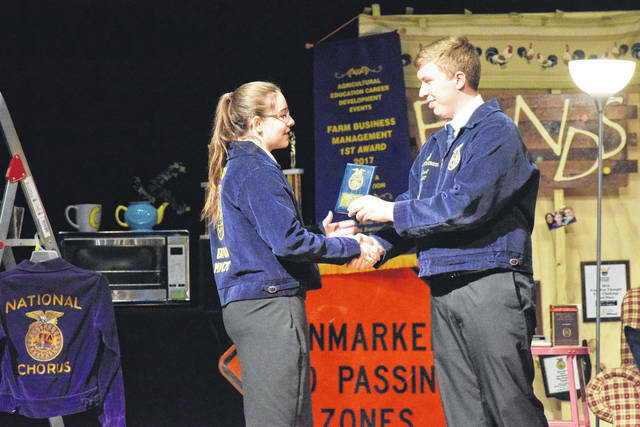 Special Awards were then handed out to various Chapter Members who had earned them. •Arica and Kendale Hamilton, Katelyn Niehaus, Jacob Renner, and Mallory Deaton were recognized for being the highest fruit sellers. 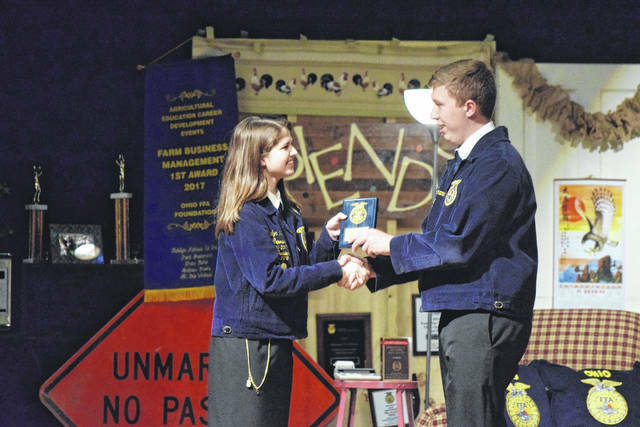 •Katelyn Niehaus received the Chelsea Hanson Spirit of the FFA Award for her dedication to FFA. 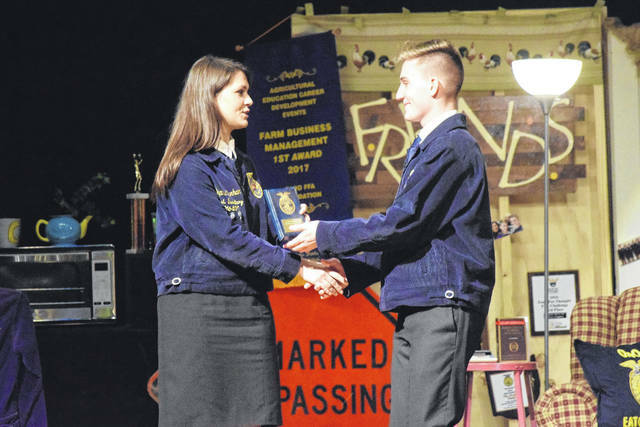 •Kendale Hamilton received the Star Greenhand Award, which is presented to the first year member who has shown outstanding leadership and dedication. 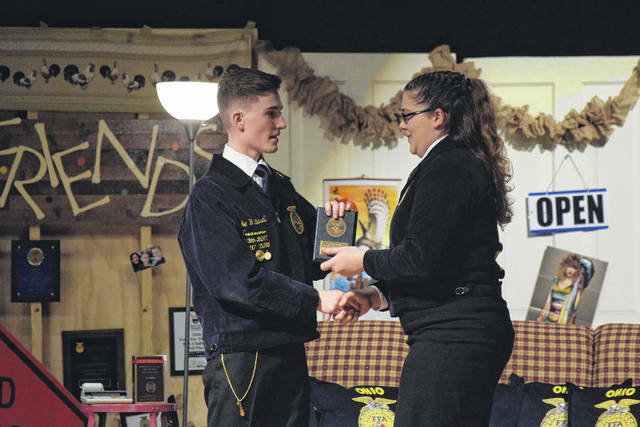 •Blake Whitesell received the Star Agribusiness, which is presented to the student who has excelled in their job placement, exhibited outstanding work ethic, and shown outstanding leadership. •Daphne Durham received the Star in Job Placement, which recognizes a strong work ethic and commitment to always performing their best on the job. 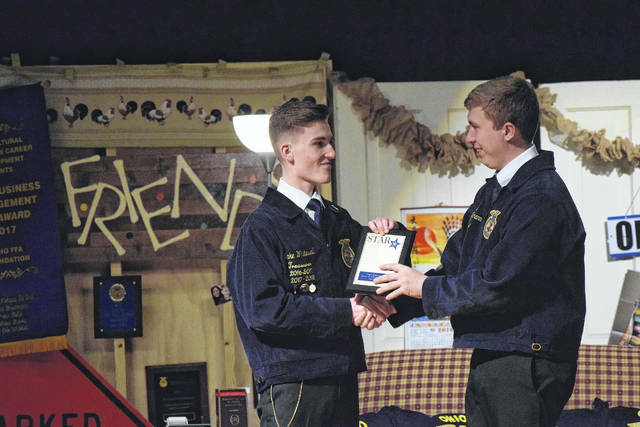 •Trent Broermann received the Star Chapter Farmer, which is presented to the student who has an outstanding SAE Production in Agriculture. 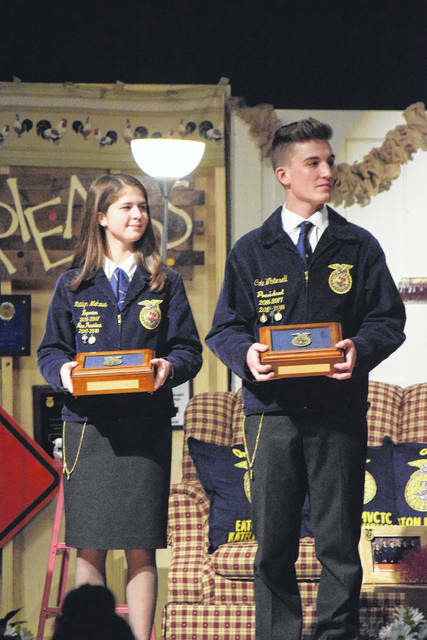 •Both Katelyn Niehaus and Cole Whitesell received the Dekalb Award, which was created to help recognize an outstanding agriculture student in high school. It is a way to focus attention on agricultural careers and the many talented people who pursue them. 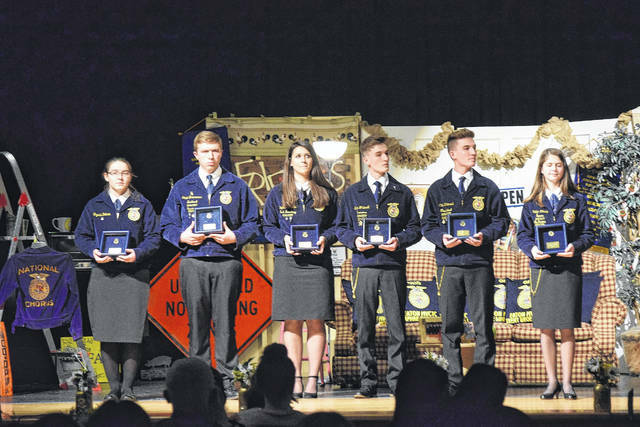 The six four-year seniors were recognized for their dedication to the FFA Chapter throughout the year. Those six include: Blake Whitesell, Cole Whitesell, Daphne Durham, Katelyn Niehaus, Trent Broermann, and Crystal Dotson. Next, all nine seniors were given a chance to hand roses to their parents and talk about the people who have made the largest impact on their lives so far. 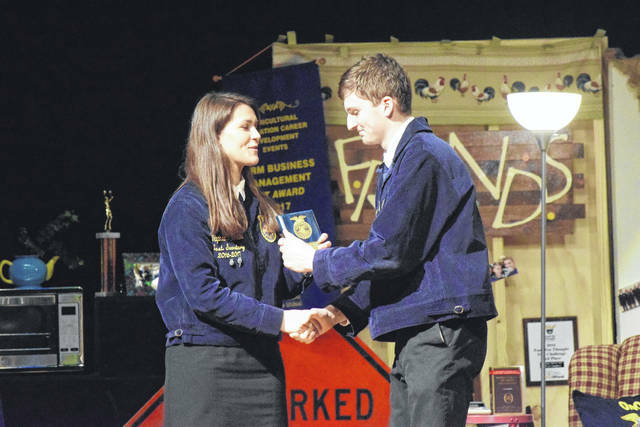 Those seniors presented FFA Advisor Rebecca Holbrook with a gift, thanking her for her support throughout the years. Finally, the changing of leadership took place. 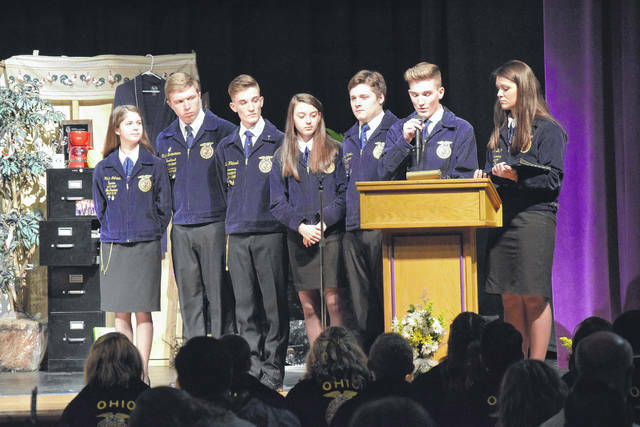 The chapter introduced their 2018-2019 Officer Team, including: President Andrew Brooks, Vice-President Becky Wright, Secretary Mallory Deaton, Treasurer Jacob Mcintosh, Assistant Treasurer Abby Wyson, Reporter Kendale Hamilton, Assistant Reporter Rebekah Ruthers, and Sentinel Ryan Brooks. 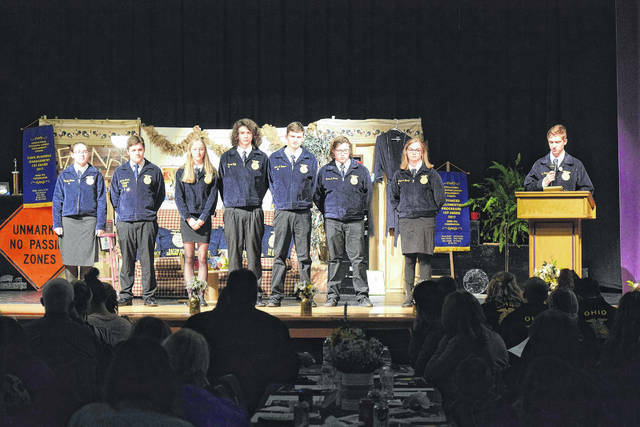 https://www.registerherald.com/wp-content/uploads/sites/41/2018/04/web1_FFA7.jpgEaton Miami Valley Career Technical Center (MVCTC) FFA held its 69th annual awards banquet on Thursday, March 29. This was an opportunity to share with the community what the chapter has achieved throughout the year and to honor 2018 graduating seniors.